Stefan Schmitt studied physics at The University of Victoria and education at Simon Fraser University. 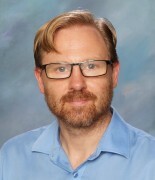 He has been teaching science and math in the Vancouver school district since 2010. Stefan has been teaching the Mini Science 9/10 course since the fall of 2015. Apart from teaching Stefan has a keen interest in the construction and repair of guitars and other stringed instruments. He also enjoys the great outdoors especially canoe and kayak trips as well as bicycle touring.